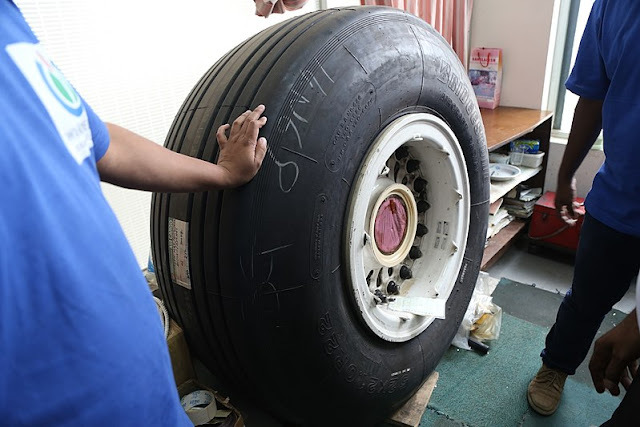 Home / Aircraft Parts / How are aircraft tires built? When airplanes land safely on the runaway after a long flight, people appreciate the skills of the pilot, but do we ever thank the engineer designers, who are behind the creation of the shock absorbing tires? One thing which is very rarely seen is that when an airplane tire hits the tarmac the tires do not face a blowout. Think about it! The airplane tires hit the tarmac again and again with a speed of 170 miles per hour and bear the weight of a small building (around 40,000 kg), but they hardly refrain to perform their job. Aren’t you amazed by the aircraft tires ability to withstand the weight? Aircraft simplistic appearance may lead some of us to a false feeling of complacency. Many aircraft technicians are not aware of the critical design factors that play an important role in the quality of every aircraft tire in use today. And minor flaws in aircraft design and production can lead to disastrous results, and inadequate maintenance practices can lead to shorter tire lifespan causing unsafe operating conditions. When one thinks of the forces that aircraft tires endure, it feels amazing to have such skillful talented engineers onboard to have invented such a special product. Some aircraft tires are subjected to speeds as fast as a race car while at the same time support more weight than the largest land vehicles. These factors make aircraft tire design a very critical process and an important step in safe aircraft operation. These tires are combined together by a vulcanization process. Vulcanization process is a chemical process for converting polymers into more durable materials by introducing crosslinks. This process of treating crude or synthetic rubber or similar plastic material chemically to give it useful properties (such as elasticity, strength, and stability). There are mainly two types of tires:- Radial and Bias, each type has unique components reflecting different technologies applied to design, compounds and materials. To understand the difference between these two different types of tires, you have to first understand the meaning of ply rating. Ply rating is a rating of how many layers of rubber is on a tire. The number of layers of rubber and the angles at which they are laid dictate the strength and load capacity of the tire. The bias ply tire consists of layers of rubber running diagonally at approximately right angles to one another The bias tire are currently in maximum because of their strength. ITF (Inter Tread Reinforcing Fabric) is used in a bias tire. It provides additional high-speed stability, reduces tread distortion under load, protects the casing plies from damage and can act as wear indicators on re-manufactured tires. In aircraft with radial ply tires, tires have layers of the tire running radially at an approximate perpendicular to the center line of the tire. Radial ply tires are low in weight as compared to the bias ply tire but have less strength. It is a special composite rubber formulated to resist wear and tear, cutting, chunking, and heat build-up. Circumferential grooves are molded into the tread to disperse water from beneath the tread in wet runway conditions. The tread also helps to reduce the risk of aqua planning and improves traction and grip between the tread and runway surface. Tire shoulder is the portion of the tread between the tread center and the tire sidewall. The tire shoulder offers support and protection to both the sidewall and the tread. The shoulder is a thick part of the tire, enabling the tire to more easily hold its form during cornering maneuvers. The foundation strength of the tire is provided by the casing plies. Casing plies are layers of fabric coated with the high modulus of elasticity rubber on both sides to improve its elastic strength. Casing plies are wrapped around the beads (Bead is a wire used for attaching two things very strongly) for proper fitting. The bead wire attaches the tire to the rim and ensures an airtight seal. Bead consist of bundles of high-tensile steel wires, each strand of which is coated in rubber compound and wound into coils of the correct diameter for given tire size. Chafers are made of tough nylon material and are fitted around the bead clinch area to resist chafing damage (It is damage caused to the skin of tire due to repetitive rubbing) to both tire and rim flange. The sidewall is the area of the tire between the shoulder and the bead. The sidewalls of the tire are covered with a layer of specially formulated rubber treated with anti-oxidants. The sidewall of the tire protects the casing from the effects of weathering and offers resistance to cuts and flexing. Tubeless tires have a layer of rubber bonded to the inside of the first casing ply from bead to bead to resist the permeation of nitrogen and moisture into the casing. The under tread is a layer of rubber that is designed to improve the adhesion between the tread and the casing plies. 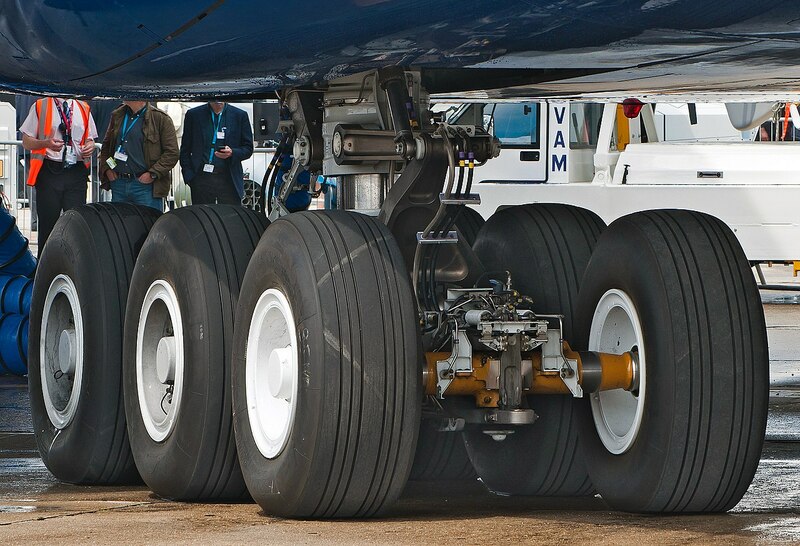 The pressure of the air inside the tires of the airplane is what supports the whole airplane. The tires are inflated to 200 psi (1379 kPa), which is about six times the pressure used in a car tire. This gives the tires extra strength to make all the high-speed landings. This amount of pressure varies in jets. 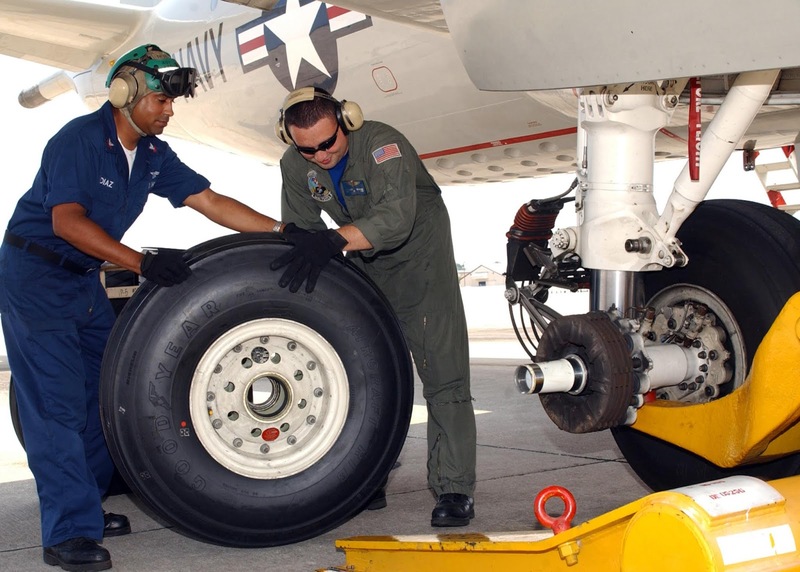 For example, the tires on an F-16 fighter are inflated to 320 psi (2206 kpa). Tire inflation is the most critical issue when inspecting the installed tires. Overinflation and underinflation, both are not good for the tires. Overinflation causes damage to the tires by causing uneven tread wear, reduced traction, increased susceptibility to cutting and increased stress on the wheel assemblies. Underinflation is more damaging than overinflation. It produces uneven tread wear and shortens tire life due to excessive heating. Heat damages the tire rubber fabrics and compounds. Tire inflation is difficult to determine visually. Always use a gauge to check inflation. If servicing is required, dry nitrogen can be used due to its inability to sustain combustion. If regular shop air is used, inflation and damage are caused to the tire due to the difference in temperature and pressure. Nitrogen also helps to reduce corrosion at the wheel assembly. The important thing to remember related to tire inflation is the change in pressure with temperature changes. For every five to six degrees Fahrenheit change in temperature, there is approximately one-percent pressure change in the same direction. This should be taken into consideration if the airplane/aircraft is going to be subjected to extreme ground temperature changes. In that case, the tires should be sufficiently inflated to ensure that the minimum required pressure is maintained for the cooler climatic conditions. Always remember to check the tire pressures when they are at ambient temperature. One thing that needs to be noted for newly installed tires is that the tire pressure will drop initially due to tire expansion, this thing is normal and to tackle this, the tire pressure should be checked closely until it stabilizes (usually about 12 hours) at rated inflation. If it still exhibits a significant pressure drop after that, the tire should be inspected for possible leaks and corrective action should be taken. Tires should be taken care of by keeping them clean and free from oil, hydraulic fluids, grease, tar, and solvents as all these chemicals have a deteriorating effect on the rubber in the tires. Aircraft tires are affected by sunlight and weather extremes. Installation of protective covers can help protect tires on an airplane that are tied outside below. Each plane has a different number of tires depending on the type of airplane. The weight and speed of the aircraft determine the number of tires on the plane. Boeing 777s uses 14 tires, while the Airbus A380 uses 22. That means that if one suffers blow out or lose its tread during a high-speed landing there are plenty of others to support. Luckily, the tires don’t blow out as they are made very strong and durable by using high quality of different types of a layer of polymer. Suggested article: What was the first aviation accident?